This clip will show you everything you need to know, but you should read the “How-To” after the jump! I love coffee but have never heard of people doing this. What a cool way to appreciate coffee! Do you have any recommendations about where to buy green coffee online, and what to look for in a seller/quality of beans? Great tutorial! I look forward to reading/watching more! 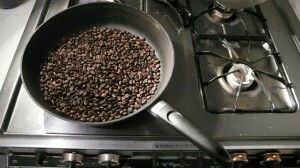 I’ve never heard of roasting your own beans, but I am very interested in trying it. I’ve started making my own dog treats and dog food to save money, and can’t wait to try making my own coffee as well! Also, as we all try to lessen our Carbon Footprint, I was wondering if you know of anywhere to purchase pesticide-free, or organic green coffee beans? I look forward to learning more about coffee!